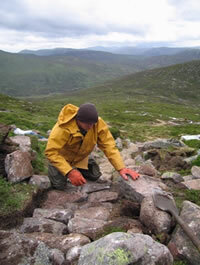 The Eastern Cairngorms Access Project (ECAP) has been a £2.4 million programme for Upper Deeside and Angus, and operated between 2003 and 2006. Most of the funds came from the EU European Regional Development Fund Objective 2 programme (45% of eligible costs) and the Heritage Lottery Fund (30%), with the rest from Scottish Natural Heritage (9%), Aberdeenshire and Angus Councils, Scottish Enterprise and other local partners. This makes a total of about 26 km. 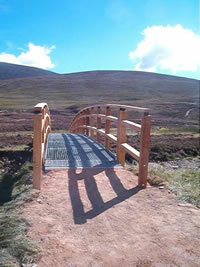 Lower-level investments include path networks around many Deeside settlements, and the car parks at Glen Muick, Inverey and Invercauld. Restoring mountain paths is nowadays a highly technical business, involving everything from soil mechanics and landscape design to medium engineering and helicopter costings. But it has its human dimensions as well: these include assembling skilled and motivated work teams to understanding the attitudes and intentions of hillwalkers and estate owners. Even without the delicate attentions of mountaineering boots (let alone bikes and crampons), weather and wildlife mean that even the best planned mountain paths need repair from time to time, and the ECAP project entailed a maintenance commitment for several years ahead. 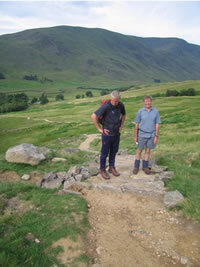 The question of funding and implementing routine and minor repair work on paths etc. is an increasingly urgent one, now that most of the major capital investments have been carried out. An obvious source is car parking fees, such as from Glen Muick, which is currently bringing in about £30,000 per year  all going to footpath maintenance, but may not be enough. And various options for monitoring and improving path conditions throughout the area are being considered  from using contractors and/or volunteers to appointing lengthsmen (or women?) as a local self-employed community resource. Standing back, can a judgement be made on ECAP, at least from a mountaineering point of view? There is no doubt that the hill paths in the area needed attention, after years of neglect (not to say degradation by bulldozing etc. ), as well as rising use by walkers and bikers. Some were braiding badly, and creating ugly scars in some much-loved areas. Others simply tested the endurance of travellers, and the quality of their footwear. Establishing new paths has never been one of ECAPs objectives, and perhaps only the Slugain-Quoich link, now completed, will create a new(ish) hill route. But better paths, especially if biked, mean faster journeys towards or onto fragile plateaux, and erosion on the highest ground may well be accelerating. Another problem is multiple use  quite apart from unexpected overtakings, a surface suitable for walkers will not stand up long to braking bikes. Ideally, bikers would have their own tracks  but that is usually not possible. The writers view is that bikes should be discouraged  perhaps by a suitable sign and a security bar  beyond the current landrover tracks. The north side ofMount Keen remains as a major project that is yet to be undertaken and funded. It is on difficult ground and in an obvious location. More generally, how are the new surfaces and routings standing up? And what about new fashions eg memorials, geo-caching, heather-skating? sub-Corbetteering? These all introduce new issues that need to be tackled. Back in 2000-2001 (i.e. before ECAP), a strategic condition survey and a community-based prioritisation workshop were held in order to assess the overall situation and identify the main candidates for action. Now, with the National Park and its Outdoor Access Strategy in place for the Cairngorms as a whole, it is perhaps time that a follow-up exercise should be held, with hillwalkers and others involved, so that progress can be assessed, lessons learned, and the future discussed.